Drum Inserts & Liners, Plastic Protective Liner for Drums, Rigid Barrel & Pail Liner, Flexible Anti-static Insert, Strainers at Global Industrial. Protective Lining Corp. 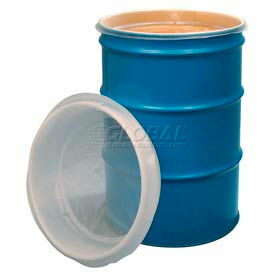 Drum Liners and Inserts allow Immediate Reuse of Steel Drums and Containers with No Need to Clean or Recondition. Protective Lining Corp. Drum Liners and Inserts are made with FDA approved low density, leak-proof polyethylene for long lasting durability. Inserts used for mixing and pumping applications. 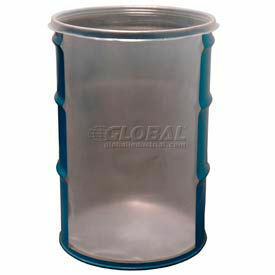 Contoured lip helps prevent leakage between the Insert and the Drum wall. Pleated models fit varying reconditioned Drum heights. Smooth Wall models maximize recovery of contents from new Drums. Liners have with snug fitting round bottom fold over outside of Drum or tie at top to help prevent contents from mixing and leaking. Styles are Inserts and Liners. Types are Pleated Walls and Smooth Walls. Gallon capacities are 5, 30 and 55. Protective Lining Corp. Straight-Side Liners have a Rigid Smooth Wall that is Easy to Insert and obtain Full Product Recovery. Protective Lining Corp. Liners are vacuum formed to provides a seamless, sturdy insert to help extend container life. Liners help reduce cleaning and disposal costs, and are great for use with reconditioned Drums, high-speed pumping and mixing equipment. Curled top flange prevents seepage of liquid into the container, eliminating pull-down concerns and product contamination. Smooth side walls offer easy cleaning and excellent chemical resistance. Liner Inserts are constructed of FDA compliant polyethylene that is used for storing food, cosmetics and pharmaceutical products, as well as paints, inks and adhesives. Sold in package quantities. Pink Anti-Static Liners are available that are molded with a special static dissipating agent to reduce static build-up. Protective Lining Corp. Anti-Static Liners are for use with Paints, Inks and Sealants. Protective Lining Corp. cylindrical shaped flexible Liners allow for the reuse of Drums without the need for time-consuming cleaning. Liners feature a 360° heat seal design that holds light weight and extremely viscous products. Anti-Static Liner is specially formulated with an internal agent that dissipates static charges away from potentially flammable products and eliminates dry chemical static cling. For use with Drums used in the bulk processing and packaging of foods, chemicals, pharmaceuticals, adhesives, sealants, coating, inks, dyes, paints, varnishes, colorants, powdered products and more. Round bottom shape design minimizes wrinkles and folds, allowing the complete recovery of valuable product. 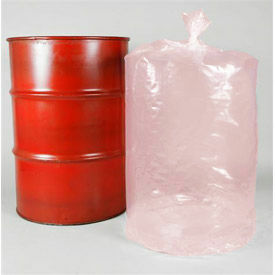 Pink low-density polyethylene (LDPE) liners are constructed using FDA approved resin. Sold in package quantities. CDF EZ-Strainer Drum Strainers Keep Unwanted Particulates Out of Drums. CDF EZ-Strainer Drum Strainers lie on the top of any 55 gallon Open Head Steel Drum, allowing valuable material to be poured through while removing debris and particulate matter. Strainers can be used to remove debris from paints, coatings, adhesives, silicone, ink and any other liquid that needs to be particle free, and are great for cleaning parts over a Drum by placing the parts in the inset and capturing the cleaning solution in the Drum below. 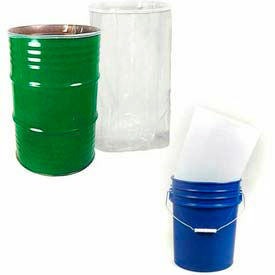 Patented lip ensures the Strainer stays in place, and can be used with or without a Drum Liner. Strainer Insert is molded from high molecular weight, high-density polyethylene with a 200, 400 or 600 micron multi-element mesh center screen. Temperature resistant from -20 to 180°F. Sold in case quantities of 15 Strainers. 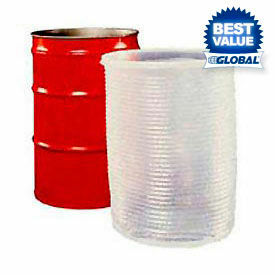 Save Valuable Time Cleaning Steel Drums by using CDF DrumSaver Drum Inserts. CDF DrumSaver seamless, vacuum-formed Drum Liners have a contoured lip that snaps over an Open Head Steel Drum's top bead, preventing leakage between the Insert and the Drum wall. Straight-sided Liner features a band of accordion pleats at the top of the Insert allowing closure using standard ring and bolt or lock assembly. Insert is molded from FDA approved low-density polyethylene for durability, and fits new and reconditioned Drums, including Drums with follower plates. Inserts can also be used when rolling Drums. Perfect for mixing, pumping and storing nearly any liquid, powders and pastes including chemicals, inks, adhesives, greases, paints, coatings, silicones, and food. Temperature resistant from -40 to 175°F. Sold in case quantities of 20 inserts.